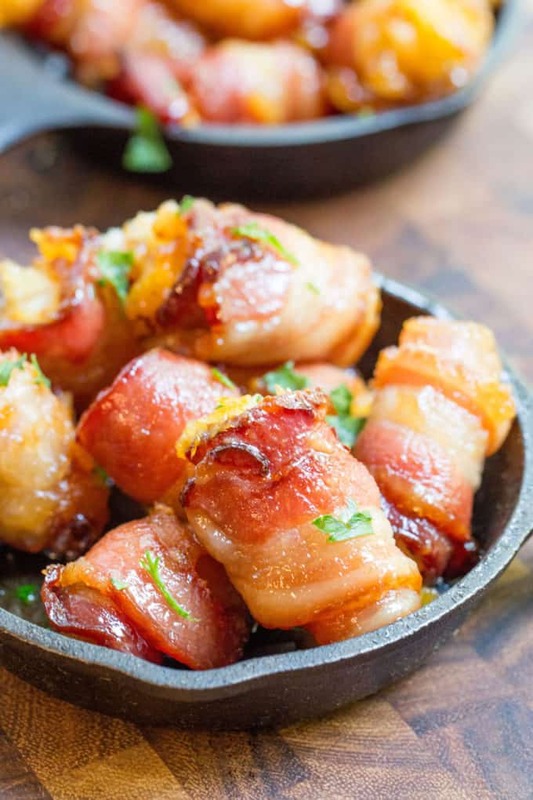 Bacon Wrapped Tater Tot Bombs are an easy appetizer of tater tots and sharp cheddar cheese wrapped in thick cut bacon, rolled in brown sugar and baked. Bacon Wrapped Tater Tot Bombs are dangerous. Dangerous in the same way the Chicken Fire Poppers a couple of weeks ago were dangerous. They’re so delicious you’ll immediately want to crowd the pan to eat them as quickly as possible only to realize 20 minutes later that eating 12 of these may be a bit overdoing it. 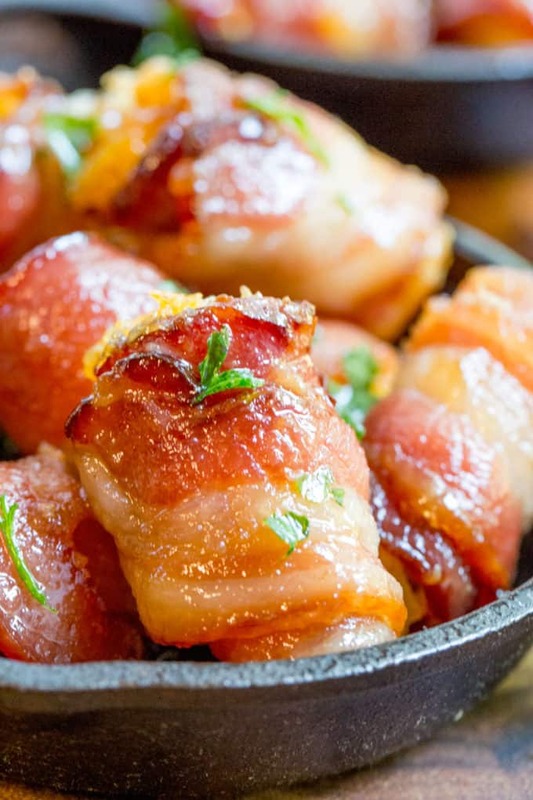 But hey, thats why the Bacon Wrapped Tater Tot Bombs are labeled as appetizers. Sharing is caring, about your fellow friend and your stomach! Here’s a video to show you how easy it is! 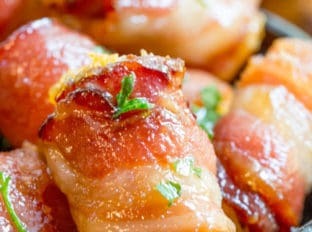 I used to cater a lot of parties for clients and when I’d show up with my plan I’d created for the event I’d hear things like “Do you do little pigs in a blankets?” and “ooh let’s do those mini grilled cheese sandwiches with tomato soup shots again!” I learned quickly to keep the appetizers craveable, fun, playful and indulgent. 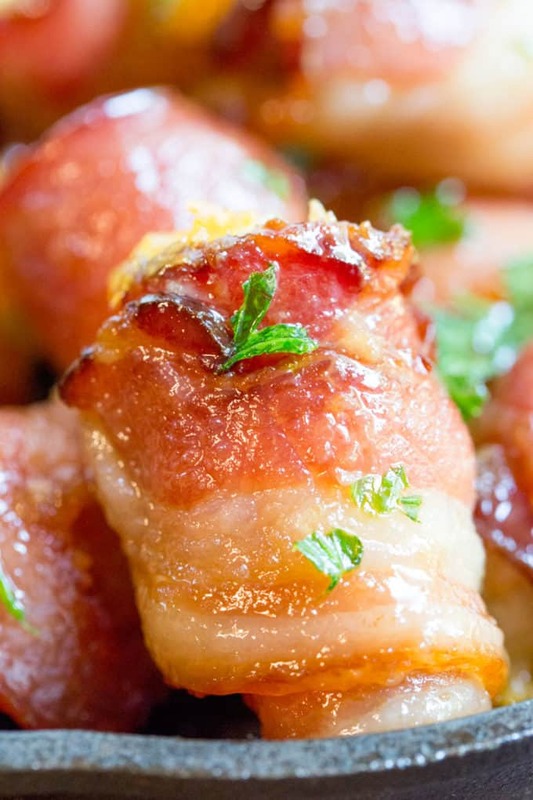 These Bacon Wrapped Tater Tot Bombs are no exception to that rule. I use quality ingredients and they turn out great without feeling like you’ve gone too far over to the processed side. 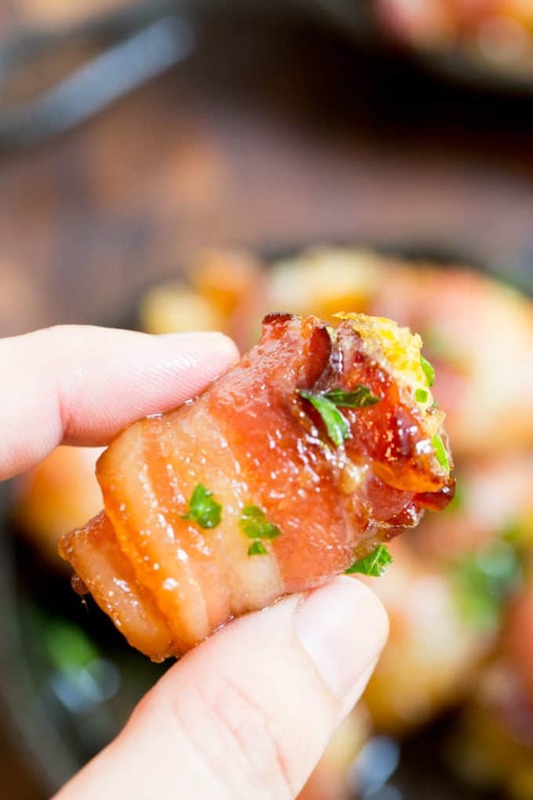 A good sharp cheddar, thick cut bacon, organic brown sugar and organic tater tots (I used Cascadian Farms) are the only ingredients you’re going to need to make these delicious little Bacon Wrapped Tater Tot Bombs. 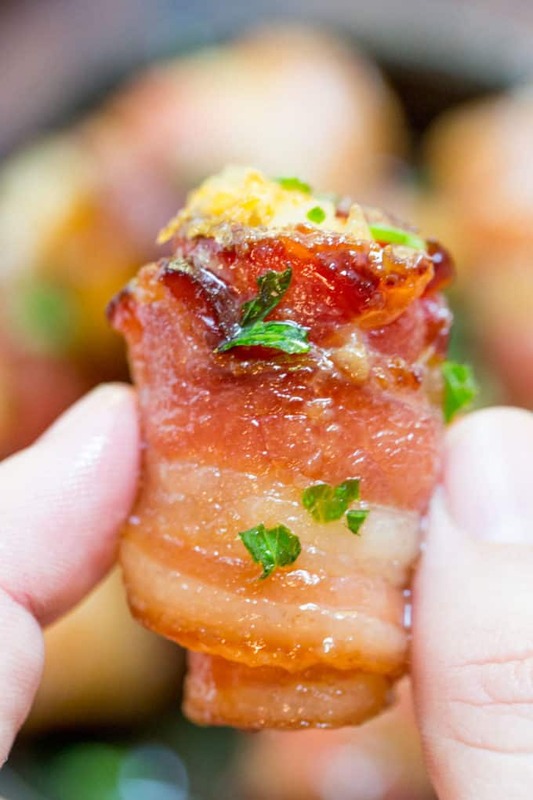 I don’t know about you, but brown sugar caramelized little bacon bombs are basically heaven coated in bacon (which is also heavenly around here) and the crunch of the potatoes inside with the rich melted cheese is (yep I’m going to go there) a party in your mouth. 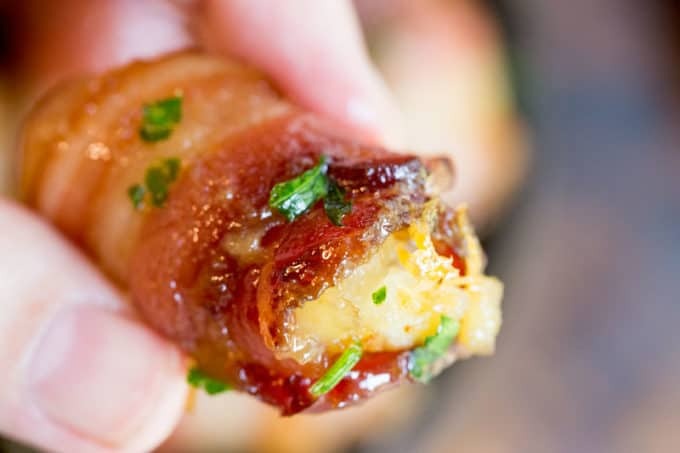 The outsides of the Bacon Wrapped Tater Tot Bombs are crispy and sticky with an amazing coating of the melted brown sugar mixed with the bacon fat (so wrong and yet so right) and the insides have a delicious melted cheese and crispy tater tot filling. 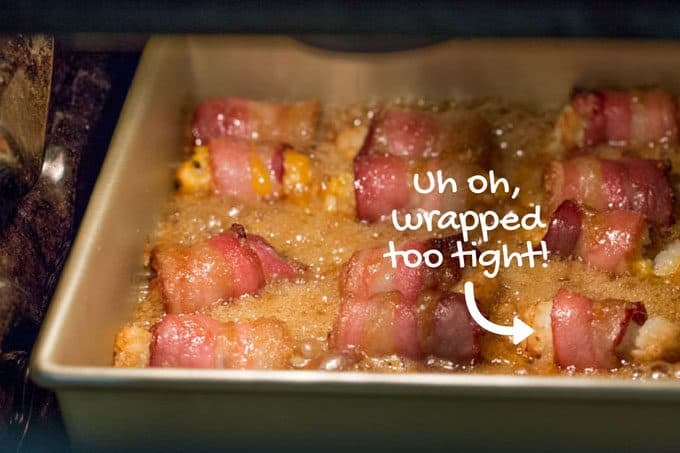 As easy as these Bacon Wrapped Tater Tot Bombs are, you just want to be sure you don’t roll it too tight as it will tighten up even more during baking and break the tater tot inside, but just tight enough to not leave extra slack. Brunch: You could serve these along with some mini egg frittata bites made in a muffin tin/mini muffin tin for the perfect little bites to accompany this recipe. Game Day: Can you imagine how fast these would disappear at a football game viewing party? I’d would probably at least double the recipe. Holidays: It’s a well known fact that between October 30th and December 31st calories don’t exist. These would be perfect at any holiday party you’re hosting (though maybe not great for taking to an office party since they would cool completely and while still delicious, they are 500% better warm. When you are cutting your sharp cheddar cheese you can cut them the same height and width as the face of your tot, but just make sure that the squares are thin since your bacon should still wrap around the tots without creating a bulge for the cheese. 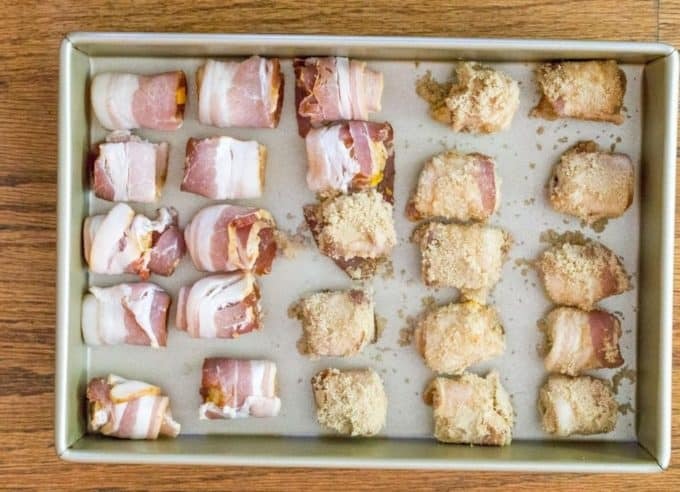 Roll each tater tot with a piece of cheese on it in the piece of bacon. You don't want to roll it too tight as it will tighten up even more during baking and break the tater tot inside, but just tight enough to not leave extra slack. 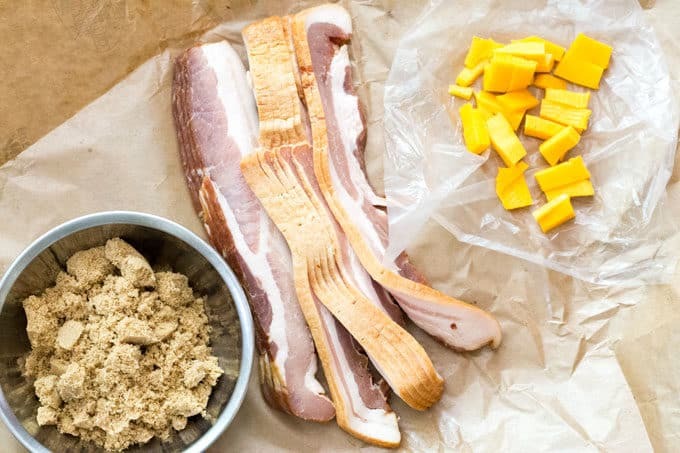 Add the brown sugar to a small bowl and dip each bacon tater tot bomb in the brown sugar. Put each one in the baking pan bacon seam side down. Bake for 15-18 minutes or until you bacon is browned. Careful when removing from the pan, your brown sugar is now basically molten sugar and can cause a sugar burn if you handle them immediately. Adapted slightly from This Grandma is Fun. I love their page for fun ideas and recipes and the major edits I made here were just in cooking time, and the method, but the recipe stayed primarily the same. What spice is sprinkled on the finished tots? Has anyone made these ahead of time? If yes how did you do it? You can definitely prep them ahead of time but wait to bake them until right before serving. 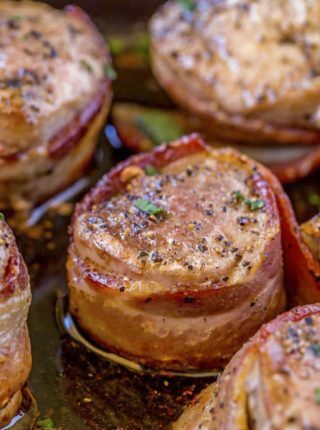 Have you ever tried turkey bacon? No, unfortunately turkey bacon just doesn’t have the fat content you want with this recipe. You can use it but it won’t create the same sort of crispy layer for the outside. Sorry. Oh. Oh my god. In the best way possible, I want to die eating these. Haha, they are super addicting! These are soooo good and easy to make. Mine cooked longer than 15 mins but I like my bacon well done. Will DEFINATELY make again!! Thank you! They are a HUGE hit in my house too!! Could you keep these warm in a crockpot? Yes, but they may not stay as crispy. The tots would get soggy from the steam. Can these be made using a crock pot? Do you know how long I would need to cook them? The crock pot wouldn’t get the tater tots crispy and the bacon may not get crispy either, so it is probably better to stick to the oven. 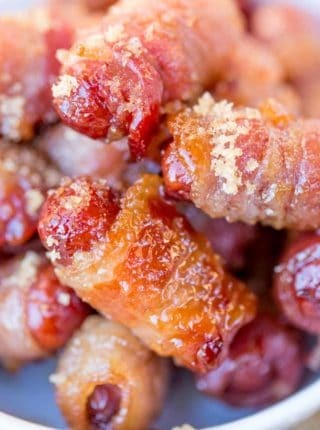 Slow cooker bacon wrapped smokies work because with the bbq sauce they usually sit in, they don’t need to get crispy. i think that if you par cooked the bacon before putting everything together it would really help these not be greasy and help the bacon be crispier. I’ve tried the par cooking, but the problem then is the meat tenses up so you won’t get a good wrap around the tater tot. When raw the bacon can stretch a bit more, then sort of shrink wrap around the tot. I just made a small sample to try before making for a party. I put mine in for 15 minutes and noticed the bacon still had a while before it was completely cooked so I went the whole 18 min. The bacon was still under cooked but now the cheese was over cooked. When I pulled them out they were swimming in grease so I thought I’d put them on paper towels only to have to scrape them off the pan, which shredded them. Obviously this didn’t work out the way they are intended to, but I want to make these cause they look amazing. Any idea what I can do different? I made these today and they are great! They are greasy so I would suggest sitting them on a paper towel to soak up the grease before serving. The tots I bought were small so I cut the bacon in thirds to make a little bit more. 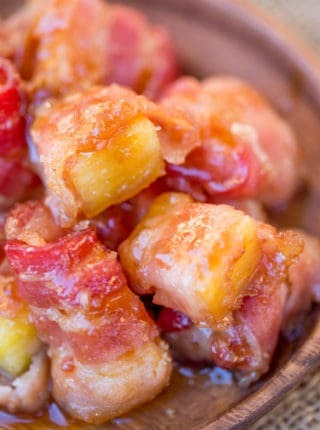 Are the tater tots frozen, defrosted or cooked prior to wrapping in bacon? Frozen is fine, they will naturally defrost a little while you’re making them. 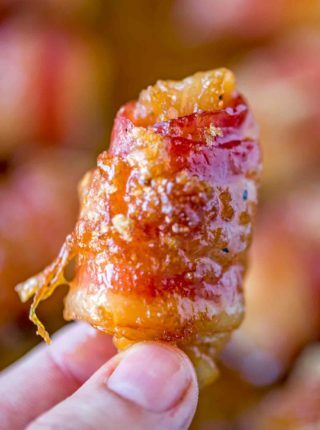 I love just about anything with bacon, and I would definitely devour a few of these! Holy crap, Sabrina, what are you doin’ to me?? These look positively EVIL–in the best possible way! I am certain that I would have to make two batches for any gathering, and one would be only for me! Wow. If these aren’t the tastiest little morsels I’ve ever seen, I don’t know what is! Just incredible!! Oh my gosh – these have me drooling. They look wonderful! Oh my gosh, these are dangerous – I’d be found guilty of eating the entire batch all by myself!! Oh my gosh! Definitely fun and indulgent! What a great treat for a party! These will be great for our next BBQ! I agree! These would be super dangerous to have in my house. I’d eat them up in no time! You are killin’ me with how wicked good these look! I would love to snack on these at a party! They sound delicious. Sabrina…this is the devil to all diets!!!! HOLY WOW!